Comprised of 1st - 5th graders from Elma Primary Elementary School and surrounding area. Contact us if interested in joining our pack or if you have any questions. We have den and pack meetings at Annunciation School, Clinton St., Elma. The pack meets regularly on the second Monday of every month at the Annunciation School Gymnasium. We invite your son to join the country’s largest youth organization, Boy Scouts of America. Scouting is fun-filled, educational, and a program with a purpose. Scouting helps develop boys’ values of duty to Family, Community, Country, and others. Scouting’s aims of character building, citizenship training, conservation and fitness have remained unchanged since the program began in 1910. Boys have fun and at the same time they develop leadership skills by serving as boy leaders. 1st Grade - Tiger Cubs. The program focuses on activities for a parent-boy team from each family; each boy must have a parent partner that attends den and pack meetings and events. Activities are based around working together as a family and exploring new things. They meet once a month as a den and once with the entire Pack. 2nd & 3rd Grade - Cub Scouts. 2nd graders are a Wolf, while 3rd graders are a Bear. They meet once a month as a den and once with the entire Pack. Cub Scouting is a family and neighborhood centered program. 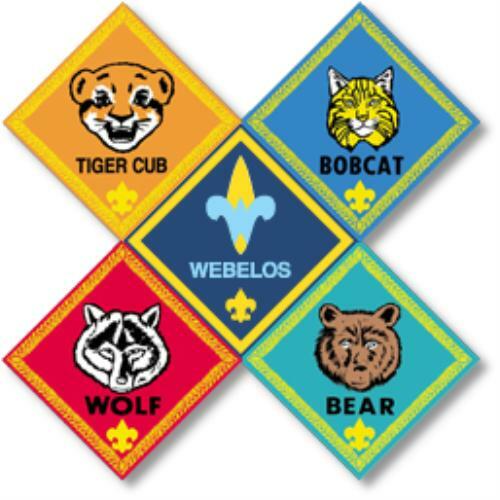 4th & 5th Grade - Webelos work to become prepared to join the adventures of Boy Scouts during the spring of their 5th grade year by participating in more challenging outdoor, building and citizenship activities. Pack 325 meets regularly at the Annunciation School gymnasium. We get out into the community and nature to make the experience more fun. We are committed to helping our school, community, and charter organization as much as possible. An application form is attached. Please feel free to fill it in and bring it to our next meeting. We meet the second Monday of the month at 6pm - 8pm. Do you have your new handbooks yet? Make sure you get your Akela to get your new handbook at the Scout Store so you are ready to progress through your rank!